When Adrian Beardsley is diagnosed with cancer at age forty-nine, no one can imagine how quickly death will come, nor the challenges it will present. This moving memoir of life’s most mysterious experience brings us into the light of an eternal grace. A profound and inspirational story about one man’s death, at the age of 50, that left everyone present in a state of awe and watching as a soul become enlightened. At first, Mary wrote this book for herself, for her husband, and for her children. She also wrote to process her grief, for healing and for solace. But she continued writing for you. For the you who also questions what this thing called death is. As she was writing Mary came to deeply understand that she did not want to wait any longer. In living this life, Mary now seeks to actively burn her own wood, cry her own tears and continues to unfetter her heart in order to love and live in such a way that when it is her time to die, she might be carried out with a full wind underneath every unfurled sail of her being, which was just the way her husband died. A companion for the dying, for those losing a loved one, and for all of us wishing to arrive at our own deaths well prepared. Click on the button below to find out more and to purchase a copy of The Final Act of Grace, or if you’re a Hobart local you can purchase a copy at Fullers Bookshop in Hobart City, The State Cinema Bookshop in North Hobart or The Hobart Bookshop at Salamanca Square, Hobart. I may Mary and her amazing family as a teenager over 40 years ago. That family was and still is so full of love despite amazing personality and philosophical differences among 9 siblings. Despite knowing Mary for all that time our paths rarely crossed and I have never met Adie, Jack or Ella. 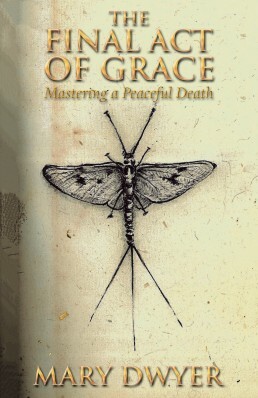 The Final Act of Grace is a book about courage as well as grace. Adie’s courage and grace in facing death and being so unselfish about it, Mary’s courage to write this book and the grace her life has become to help others. The courage and grace of Jack and Ella to allow their Mum expose their love and grief is a key ingredient that is essential to the book. At times I cried real tears, laughed out loud, felt anger and joy while reading The Final Act of Grace. It was so enthralling I read it from cover to cover in one sitting. There are lessons in this book for all of us as we face our turn to leave the mortal coil. It might sound trite, but in popular vernacular it’s a ripping yarn. The mark of a great book (to me) is one that I can not put down and where the rest of the world disappears. I sat down to Mary’s book and did not put it back down until I finished the last page. It completely captured me and left me with a resonance of inspired awe. Quite simply, The Final Act of Grace is a magnificent and courageous piece of writing taking it’s reader on a journey of the human experience. It is poignant, heart-felt and raw as the magic of the story unfolds. While this is very much Mary, Adie and her family’s story, it is a story for us all – exploring our fears around death and the possibility of enlightenment, as Adie so gracefully and beautifully transitions from this world to the next. Adie’s death propels Mary into deep grief and enquiry presenting her with questions around everything from identity, parenting, love, the meaning of life and relationship. Put this on your list of must reads. The Final Act of Grace is a beautiful expression of profound love and loss of a very dear friend. Mary’s words are eloquent, deeply moving, insightful and a wonderful tribute. I thank her for allowing the world to share the essence of Adie’s gentle soul & magnificent spirit. It is a privilege to turn each page and delve into her personal story as she generously offers insight and comfort at the end of life, as Adie transitions to a peaceful death. It is a very special story that will resonate around the world and touch your heart.